Michigan a state that looks like a mitten, houses the U.S. automotive industry, created protopunk music with the band Death, and now the proclaimed snowboarder mecca by the worlds most extreme CEO Eneliko Sean “Liko” Smith. 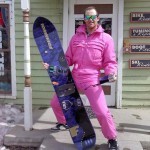 If you follow the happenings of the snowboard world then you will remember he had past dealings with Marc Frank Montoya in The Block hotel chains and had a reality television show on the G4 network. In the years since the bankruptcy of that hotel chain and cancelling of the show he has had some run-ins with the law resulting from less than ethical business practices. Now it seems he wants to play snowboard real estate developer once again, but in the state of Michigan at a previously closed resort. 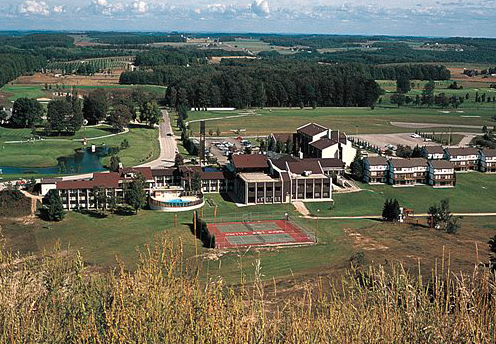 In the early 2000’s the Sugar Loaf resort in Cedar/Traverse City Michigan shuttered its doors and has been in a state of limbo on whether it will be able to reopen and serve the local community. Mr. Smith had previously been interested in the property but that interest didn’t materialize so he went on to other businesses. Not being one to let an opportunity or idea pass him by Mr. Smith has one again decided that this property in Leelenau County needed his magical business touch. Below you will find a timeline of events that can best be described as overly comical. The first press release hits the Internet with promises of a 560 acre Snowboarder Mecca called the RoK at Sugar Loaf purchased by Mr. Eneliko Sean Smith and partners. The resort will open on November 27th, 2014. No proof of purchase has been given at this point. As people become skeptical due to the shady past dealings of this EXTREME CEO, questions were asked and the local news media The Glen Arbor Sun reports on it. It’s unclear who Liko Smith’s partners would be this time, but he has long done business with Remo and Hanna Karcho Polselli, who owned the resort before selling to Kate Wickstrom in 2002 and who still control the mortgage. For years the Polsellis have played a game of cat-and-mouse with Leelanau County, paying back taxes on the property just in the nick of time to avoid forfeiture. Wickstrom told the Glen Arbor Sun this week that she no longer has anything to do with Sugar Loaf, and hasn’t in nearly a year. The property reportedly transferred back to the Polsellis in 2012, but they allegedly failed to register the deed with the county, and Wickstrom now worries that an eventual sale would reflect that she, and not the Polsellis, are selling it to Smith — what she calls “an absolute lie”. A study of the MLS real estate website confirmed that ROK Investment LLC (a real estate investment group based in Miami) is listed as the owner of Sugar Loaf, though Wickstrom is listed as the taxpayer. Wickstrom declined to elaborate further until after she met with her attorney, Joe Quandt. Phone calls to Quandt’s Traverse City office Tuesday went unreturned. As we live in a world that is now interconnected through the Internet a Facebook page for the RoK at Sugar Loaf emerged. Mention of the international billionaire investment banker Oscar Peters as a financier appears on their Facebook page and the Glen Arbor Sun continues to report. Social media suicide ensues. As arm chair quarterbacks of the lesser journalistic variety made their play on the insecurities of those attempting this venture the RoK staff responded in kind. No proof of ownership has been provided at this point as well and people continue to grow even more skeptical. At this point Benny Westrate from Michigan Boarder is able to solidify an interview with Liko himself. So… why do you refuse to furnish an undeniable article of proof of ownership? That would just almost completely end all the gossip. I have nothing to prove Benny, if someone doesn’t believe that I own it then that’s on them. I have the ownership and that’s all that’s needed for me to feel confident in moving forward. Do you see Donald Trump running around showing off his land titles and deals,..we issued a release and that’s proof enough. No, a request like that from the public is like asking to see my Social Security Card. Not relevant to opening Sugar Loaf. Your public track record as far as these projects are concerned aren’t very promising. If indeed you do own it what makes this time around different? I will admit the first time I attempted the purchase of Sugar Loaf it was somewhat chaotic. Regardless of what happened its all history now it’s time to live and learn. I did not have control of Sugar Loaf at the time. Now I have 100% control and I am exercising that control as we speak. I see everything 110% clear as day right now, there are no muddied waters like last time- I see the future of Sugar Loaf Mountain completely re-opened as The RoK at Sugar Loaf. The Words First Snowboarders Mecca. I am not going to give up on this property, and I’m not going away this time, no matter what happens, what is said, what is done or what is thought by anyone. It’s time to put aside petty differences and to get on with the mission of re-opening Sugar Loaf Resort as The RoK at Sugar Loaf by November 27, 2014. Once again no proof of purchase has been given. Another Michigan website Agnarchy.com gets an interview with Mr. Smith’s assistant. Questions are either ignored or vetted. Liko has claimed an ownership interest in the property at Sugar Loaf (and re-iterated that claim in an interview late yesterday), but reports indicate that only a preliminary purchase agreement is in effect at this time. Has the property in-fact changed hands? We are not going to address any speculative reporting done by various media outlets. We really have to keep moving forward and keep our focus on getting this resort up and running. Its as if everyone keeps losing the focus, what we are trying to do is bring life back to a place that once was the heart of a community. Liko Smith, owns the property…that is the honest truth. If Smith or an affiliated group the owns the property, can you furnish a copy of the deed to corroborate this? Since this resort has stood dormant for over a decade, ownership shouldn’t be everyone’s fixation. Getting this resort up and running again is most interesting part of this equation. Creating jobs and reviving an area with so much history should be were the people’s attention is spent. Once again the real question that matters has been dodged. Whew! That was a close one. Michigan Boarders Benny Westrate did a follow up to his original interview to try and get more information, once again the real question was dodged. Since our article we have been contacted by ex-associates of yours…ex-partners and professional snowboarders, all of them with a similar intention; to warn Michigan about you. Why don’t you answer question one and kill it all now? Funny. I own the mountain, now what? I’m at peace with the partners that matter… and to be honest, I don’t involve myself in trivial matters of the past. If people want to follow gossip, rumors and innuendo. The more they talk, I guess, the more exposure for Sugar Loaf. Life is a positive journey forward not grasping onto old negativity. That behavior will only beget negativity and to be totally honest – I’m over it. Okay- it’s true; I’m human, I have a few whiny ex partners and twice as many ex-girlfriends. I live life at full speed and I don’t put up with punks which is why my friends love me and my enemies fear me…but even dumb things I do work out; one of them is how Rob Dyrdek and I became partners. He walked up to me at an Underground Nightclub in Vegas and said “I hear you like to knock people out”….I said- “Yes- I do”…he said “Want to be partners?”…we’ve been friends ever since. We even did an episode together on Fantasy Factory (he is an amazing business man by the way) it made fun of my legal problems and the fact that I closed down Big Bear…(which he was my partner in). A year later, we were going to create an all suite hotel brand across from the Hard Rock Hotel in Las Vegas but the hotel company backed out on the licensing terms at the last minute (stupid- they went BK 6 mo. later). The point I’m making is that “good” partners stand by you and you stand by them. That’s life. Rob never complained about the closure of THE BLOCK…the only thing he ever said to me was.”That’s just business man”…a true friend to have in life and in business. I’ve made millions, lost millions. I take full responsibility either way. Men don’t’ change, they learn, you can’t learn without mistakes. I am the owner of The Sugar Loaf Resort. I am going to open The RoK at Sugar Loaf on November 27, 2014. If it gets torn down, then tear me down with it. As more people started digging into public records to find out who owned the property it was only a matter of time before news came to light. Jacob Wheeler the editor of the Glen Arbor Sun continued to investigate the developments of this proposed resort. The Glen Arbor Sun has learned, through confidential sources, that former Sugar Loaf owner Kate Wickstrom transferred the ownership deed over the long shuttered resort to Remo Polselli in March 2013. Polselli — a hotelier who together with his wife Hanna Karcho owned Sugar Loaf from 2000-2005 — signed an Indemnification & Release Agreement on March 18, as manager of “Rock Investment Advisors”. Wickstrom, who received the transfer agreement via her Traverse City-based attorney Joe Quandt, signed on March 20. Polselli paid legal fees associated with the transfer. For reasons unbeknownst to Wickstrom or the Leelanau County Register of Deeds office, Polselli never registered the deed with Leelanau County. That means, in the eyes of local authorities, Wickstrom still owns the property and could be legally liable if the County moves to condemn. On Monday, November 18, the head of Leelanau County’s Construction Code Authority, Steve Haugen, posted violation notices on the windows and doors at Sugar Loaf, warning that the lodge and other structures could be demolished for violating building and property maintenance codes. Liko Smith now appears to have new troubles to contend with. Both the Enterprise and the Traverse City Record-Eagle have reported this week that officials in El Dorado County, Calif., have issued an arrest warrant for Smith for violating terms of his probation. Smith, who has joked that he “Googles poorly” is apparently on the run. The Sun was unable to reach him, as he no longer uses the cell phone he had in early October. 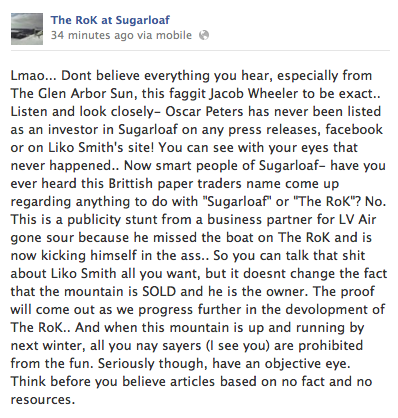 There seems to be a theme across this story and that is that no one is officially claiming ownership of Sugar Loaf other than Sean Eneliko Smith who obviously doesn’t own it. In a time when a boost to the economy is needed in most areas that are home to four season tourism, this is only hurting Leelanau County. Could the RoK at Sugar Loaf have been a prosperous idea? 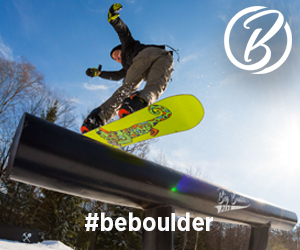 Doubtful as the idea of snowboarder or a freestyle only resort has failed in the past. In the state of Colorado all one has to do is look at the now defunct Echo Mountain and the unfinished Eclipse Mountain project. Both were similar in concept and both did not make it. There are too many factors stacked against the RoK and Sugar Loaf besides Mr. Smiths past business indiscretions. The most obvious factor being geographical location. After all this I ask the real question is Michigan a true snowboarders mecca? It’s such a joke man… one speculation around here is that Liko has some underhanded deal with Polsellis, and that this whole fiasco is merely an attempt to drum up publicity, make the project seem more viable than it really is (it’s easily $30M of investment to re-start that property), and entice a bidding war for the property. Although at this point I’m not sure who else would be interested. I find it hilarious that they continue to dodge the question of ownership. I’d been checking the county records for a solid month or two after he first claimed ownership, and nothing was there. He doesn’t own it, no matter what he insists. At best, he has some less-than-arm’s-length arrangement with Polselli. According to the shredtown throwdown on YoBeat they are. How did they come in second? It must have been due to the lack of shredding and more time spent on the interwebz. At this point, probably better to let the county bulldoze the buildings. Get a basic lodge and get the hill operational again. Liko Smith is not the guy that can get it done. I’d think it would be more likely for him to drum up some investors take their money and skip town. This whole thing is a shame because by Northern Michigan standards it’s a good hill. Someday I’m going to poach that sucker if they don’t ever get it up and running again. I’m too lazy to drive up any further than Nub’s Nob anyway.